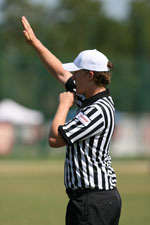 Interested in becoming a girls lacrosse umpire in Arizona? Visit the Arizona Women's Lacrosse Umpire Association Website or contact the Officials Scheduler on the contacts page under AGLA Board for more information! Officiating is a fun way to stay in shape and earn extra income while participating in the fastest-growing sport in the nation!